The terrarium is basically just a little greenhouse for growing different plants. Right now I just have a couple of things in it I had started from seed that weren't making it starting seeds off outside like a few sprouts from an orchid, seeds of desert rose sprouting, a bromeliad, aloe vera and some left over elf umbrella tree due for going outside. I have some winter stored venus fly traps due to go back into it to see if I can get any of those to actually come back. The terrarium is averaging 80 temp with 90 humidity, which is great but also means my watering dries out pretty fast even with filling pans to soak/water the pots from the bottom up. I think if I make it a little more air tight that will help and I have a hand sized fan in there for if it got too humid or needed more oxygen. There's plenty of other things I could do with this terrarium. I have an initial idea to make a vivarium out of it by turning the bottom upside down so the frame is inside instead of on the bottom. I'm going to line the bottom and sides with plexiglass and seal it with aquarium silicone so the bottom will be able to hold water without touching the wood. I might replace the sides where plastic is right now with screen mesh or plexiglass like the back of it. As far as the lighting I can leave it alone as long as I don't get a vivarium type critter that could crawl up the walls and get on it, otherwise I'll have to screen or plexiglass it off so nothing can get in there. I can still access it from the inside to change bulbs or convert the top to come up with a few hinges. I'm going to fill the bottom with aquarium gravel under the usual vivarium substrate I make with a few plants and sticks and reinforce being able to lock the door with a possible safety 'screen door' behind it. It is just ideal enough for anoles, small chameleons or nonclimbing amphibians like toads. Not so ideal for anyone requiring more special types of heating or thicker/tropical humidity better suited to a glass tank. I made these shelves, screwing things together inside the house, and actually sprung my back helping my hubby get it against this wall but it's very sturdy and easy to disassemble with just the removal of a few screws if I did something like move. Three shelves tall, it can hold three 10gal tanks in one shelf with a little room left over. They're tall and wide enough I could just as easily convert the middle and bottom into terrariums or vivariums themselves. I won't be trying that any time soon but I'll lay out the idea of it below. On the top shelf is my 20gal tall vivarium containing Hyla Arborea tree frogs and another desert tank of my other two leopard geckos. 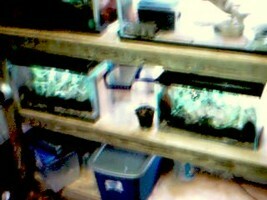 The middle shelf has two tropical vivariums, the left holds the green house frogs and the right doesn't have anyone in it. The bottom shelf is just some containers of extra accessories I don't need right now and the larger one is holding some earth worms I'm trying my hand at. 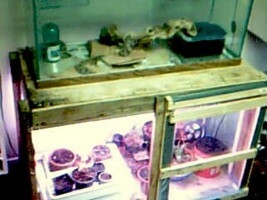 They might be later joined with a couple more containers trying out keeping termites and mealworms. I use a heck of allot of crickets and could really use some alternatives. j)*Two: greenhouse lighting fixtures, 20" to 34" fluorescent bulbs, doubles or singles. Note: Plexiglass is allot easier to cut with a hot knife. So far I still can't find a hot pen that I could really use quite often, but heating a smooth edged kitchen knife off of the stove will work. It sounds like a chore, compare it to cutting plexiglass with a glass cutter. If you intend to use the table for very high humidity terrarium/vivarium I recommend lining the inside entirely of plexiglass and using aquarium silicone glue on all the meeting sides and edges to prevent all the wood from eventually rotting from water damage. Note: *If you plexiglass the door like I show, there should be an intentional space between its plexiglass and the table where air gets in and humidity out even with a strip of duct tape across the top of the door as a guard. This would act like having to open a lid on a glass covered vivarium. As well, you might consider a mister and/or a hand-sized fan for a terrarium this size. You'd also need some kind of escape routes through the panel material for plug cords. A very sturdy, hardy table that just isn't going anywhere and can potentially handle a heavy tank on top of it. A/B: Making two rectangular frames, screw A as the outside board, with B on the inside. It should be standing or rather the 2" width side down and the 4" width side tall. C: Fit each ply board over the top of each frame and screw it down making a table. The tables should be ply wood side up. Or rather, the frame boards making empty space between it and the ground. If you want the option, you can turn the bottom table upside down, where the plywood will touch the floor. I prefered mine off the floor. I could have also made the bottom table without using one of the B boards with room down there to slide things under it like a 2" tall pan or flat storage containers. D: Using the bottom table, screw each board level with each corner of the table on the outside of the frame, like legs. Or rather, where A/B meet. The 2" width side even with A board but the 4" width on the side of B board. Flip the table over to one long side and screw the top table in place in the same manner, the A/B boards level to the top of the D (leg) boards without the D boards being any higher than to the bottom of the C ply board. This would be a good time to apply J the lighting fixtures to the bottom of the top table, at least getting the screws in the right place to attach the fixtures later. Doing it afterwards is pretty awkward, cramped and sweaty. G - Turn the frame over so the F boards are on the ground and place the piece of plexiglass inside the frame. Pre-drill holes and screw in place. H - Brace the frame against one side of the table at the very edge and apply the hinges on the outside. I - Close the door and brace this board against the side of the door length wise and screw in place. It will act as the door-stop and framing for the rest of that side for the table. You can use it to apply a small latch. J - now is more or less a last warning to apply at least the screws for the lighting that goes on the 'ceiling' for the bottom table. K - You can use any of the materials for whatever you intend to use the table for. I put another sheet of plexiglass beside the door frame and lined everything else with plastic sheeting, strengthening the edges with duct tape and using a staple gun. I also lined the bottom with plastic sheeting but you can also make a floor frame for the inside as something to completely soil substrate. *Measure the inside for a 1by4 board frame. After making the frame, 4" side tall, make a table out of it using plexiglass over the frame, even to every side. Pre-drill holes and screw in. Turn it over and line the inside of the frame with 4" tall strips of plexiglass, getting the glass to meet that of the bottom as snuggly as possible. Pre-drill and screw in place. Use aquarium silicone glue to make the inside edges between plexiglass water tight and slip it into the table. If you set it on top of some bricks before you set it inside the table, you can use the false bottom to put in pans of water to keep moisture up and cut down a little on the constant watering. *For a bird cage you could use the same principle as the plexiglass table and use it as an easy slip-out pan for bottom cleaning. Are basically the very same principle with three tables. It's 5ft by 9inches length, 1ft,5inches width and 3ft,8inches in height. If I ever needed to move it or decided to turn a table upside down to have the frame up and bottom down, I could just unscrew the 2by4's holding the tables up by the outside. Drill the bottom table to the frame boards first, then turn it to its longest side and measure the middle table into place, screw it on before adding the top table. I went with the tables having their frame sides down. If I added lighting to a 'ceiling' they could act as shade for myself from the distraction, or if I made the middle or bottom shelf a full vivarium it could act as a nice place to hide for a climbing animal like a gecko. That would have to be with the lighting on the outside, other wise I could just plexiglass or wire mesh critters away from the lighting fixtures using the frame. It's also easier for if I wanted to close it up and apply some doors without being the best carpenter in the world. You can just as well turn them over and use the table frames as drop-guards or line them with plexiglass without making a second inner frame. Fill it with sand and keep an iguana or snake in plenty of room. 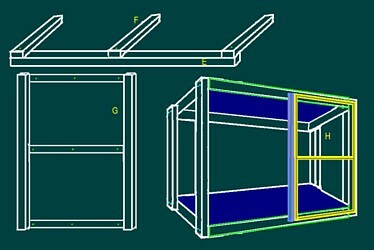 Make dividers and turn the shelves into tanks without a single aquarium, they're just virtually limitless in ideas and easy enough to put together or take apart. If you don't like the idea of their weight, just use 1by4's instead.